A DITA users group in the Portland, Oregon metro area. 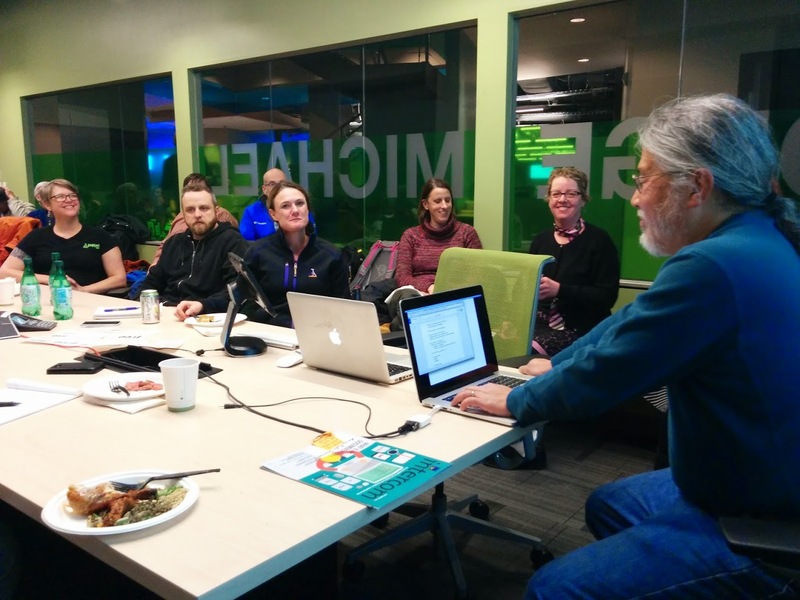 A quick and enthusiastic report on last night’s PDX DITA holiday potluck with special guests from the WritetheDocs PDX Meetup Group. But first, a picture of happy documentarians. We packed 30 people into our largest conference room for a delicious potluck (thanks Puppet team for the buffalo wings!) and a short presentation introducing DITA to prospective users. Leona Campbell and Melanie Jennings enthusiastically described the benefits and challenges of DITA as well as sharing experiences about what it’s like to get up and running with DITA when you’ve previously worked with different toolsets. Because we had a range of experiences at the table, from DITA consultants to working DITA writers to total newbies, there was a great ensuing discussion about why you’d want to use DITA rather than another tool. We also covered the need for different kinds of tooling depending on scale, the challenges of converting existing content versus writing topic-based content in DITA from scratch, and the always popular question of just how challenging it is to teach yourself DITA. Another great outcome was the robust audience recommendations of resources, both print and online. We’ll be adding to the Resources section of this site soon, so stay tuned. A big thank you to Mike Jang of WritetheDocs Meetup PDX for the opportunity to join forces, and to Melanie and Leona for a wonderful presentation. We’re looking forward to hearing more from our attendees, especially those who are starting up their DITA pilots soon. This entry was posted in Uncategorized by Marya DeVoto. Bookmark the permalink. Documentarian and DITA evangelist at AppNexus, a Xandr company; formerly Documentation Manager at Jive Software. Interested in practical and impractical information schemes, the social Internet, peace, love, understanding and dactylic hexameters. Marya, thanks so much for your hospitality. I think we all appreciated Melanie and Leona’s presentation — along with the expertise that people in PDX DITA shared with us. I just fixed your last name, also. Sorry about that! Good grief.